These days red velvet cakes and cupcakes are everywhere. But when I was growing up, red velvet wasn’t nearly as common as it is now. Red velvet is actually a traditional recipe from the South. I think one of the first pop culture references to red velvet cake was in the movie Steel Magnolias. If you’ve ever seen that movie, you may recall that the groom’s cake was a red velvet cake in the shape of an armadillo. Even thought I’m from the Midwest, I grew up eating the red velvet cake. Every summer my family and I would travel to South Carolina (Kiawah Island to be exact). We’d spend our days at the beach diving for sand dollars, and eating red velvet cake at the local town center. With the proliferation of cupcake shops, red velvet is everywhere. While I love red velvet, I have to admit, I’ve had my share of bland red velvet cakes and cupcakes. But these Red Velvet Crumb Doughnuts are anything but tasteless. These Red Velvet Crumb Doughnuts are made with buttermilk, and they prefect amount of vanilla and cocoa to make the fluffy, tender, and full of flavor. Yes, the cocoa doesn’t make them that bright red, but I still think they’re just as pretty. Plus, they are the perfect festive treat for Valentine’s Day! 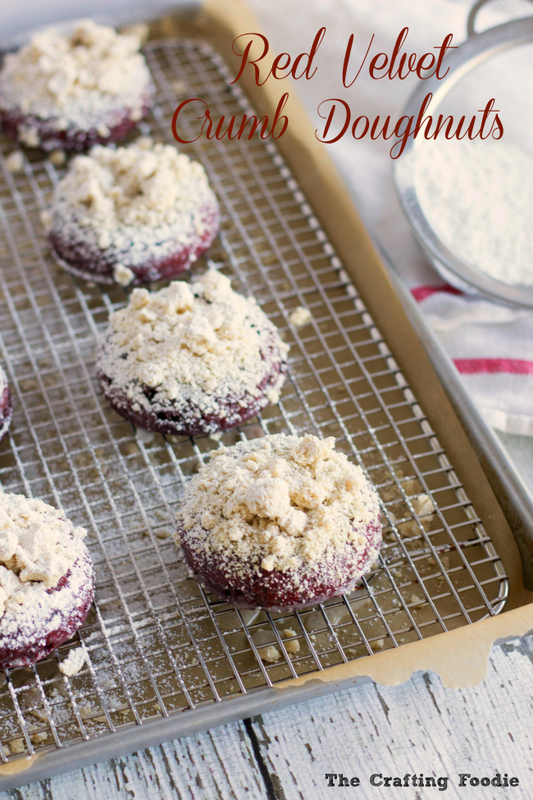 Get the recipe for these Red Velvet Crumb Doughnuts at The Tastes of Lizzy T’s. You can find the recipe here. Wow, now I want these for breakfast! red velvet is my husbands favorite! I might have to surprise him with these for vday! Thanks for sharing! Red Velvet is my Daughters FAV!! I’ll have to give this recipe a try! I love anything red velvet!!! These look so so yummy!!!! I might be drooling. Those red velvet crumb doughnuts look amazing! Wow! Absolutely gorgeous! My husband grew up eating red velvet cake, so I’m sure he would love these (and love me more for making them)! Oh my word these look unbelievably delicious!! Um, yes please! These doughnuts sound amazing! This post came at the perfect time. Tomorrow is my cheat day, I will be making these! This recipe looks absolutely AMAZING. I have already pinned it–red velvet donuts are my favorite food EVER. I read the recipe and noted it down too! I am thinking of adding a few small cherries or raspberries on the top to give it a valentine’s day look! OMG!! I like red velvet but my fiance loves red velvet. Then on top of that loves donuts, I think I will make these as part of his Valentine’s Day gift. These look amazing! 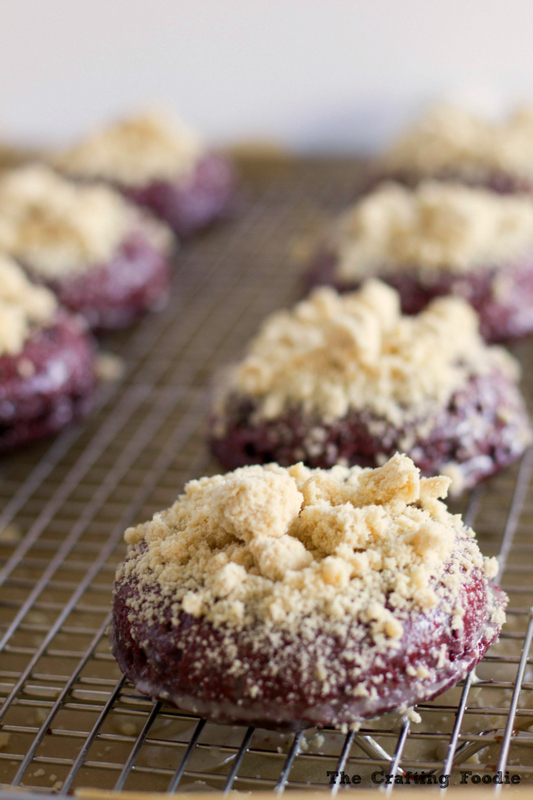 I love red velvet, and I love donuts… so this is pretty much the perfect recipe! They look SO good! Man, these look good! It’s Saturday morning and doughnuts should be in order! Those look AMAZING. Seriously. They look delicious and beautiful. 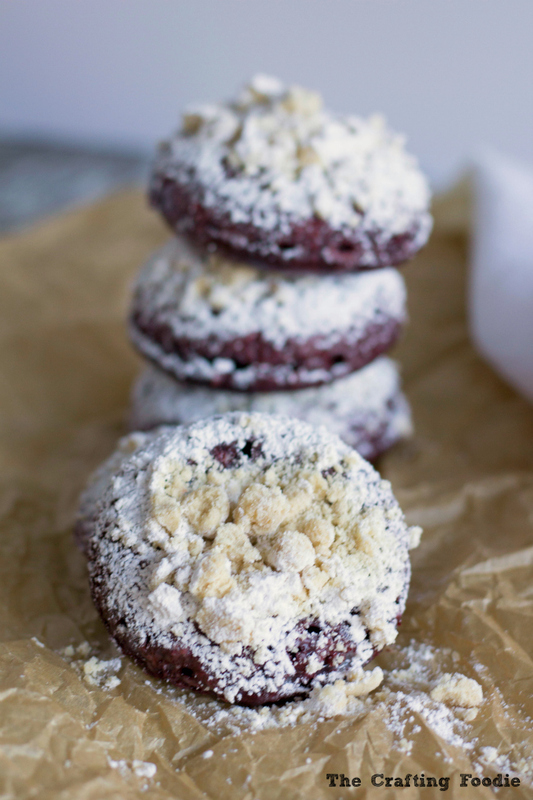 Wow these red velvet crumb doughnuts look so darn good! It’s like you got all the best things about desserts and put them into one treat! Thank you for sharing a great recipe! Oh yummmmm! I was never a huge fan of red velvet until recently and these sound amazing!